Nov. 18, 2014, 11:25 a.m. The newspaper partnered with the Solutions Journalism Network to launch Education Lab, which aims to get beyond the problems to potential ways to fix them. By Joseph Lichterman @ylichterman Nov. 18, 2014, 11:25 a.m.
For nearly two decades, a community group on Chicago’s Northwest Side has been recruiting parents to spend more time in their children’s schools. Since its formation in 1995, about 1,800 parents have spent two hours a day during the academic week in their kids’ school for a semester or more through the Logan Square Neighborhood Association’s mentorship program. Teachers and administrators say parents’ increased presence boosts math and reading skills, as well as students’ motivation. A number of academic studies back this up as well. Parental involvement, many studies say, helps students succeed in school. The program is now run in 65 schools all over Illinois. The Logan Square Neighborhood Association and its successes are a great subject for a newspaper profile: a program that’s making a difference. So it’s not surprising that education reporter Linda Shaw devoted 2,300 words to a story on the association. But Shaw doesn’t cover the Chicago Public Schools, and she doesn’t work for the Chicago Tribune or the Sun-Times. Shaw is The Seattle Times’ education editor, and her report on the Logan Square Neighborhood Association appeared on the Times’ front page last December. The story was part of a series called Education Lab, a partnership between the Times and the Solutions Journalism Network. SJN advocates a form of journalism where reporters present potential solutions to issues in order to better inform and engage readers and decision makers. Throughout the partnership, which began last October, Education Lab has published in-depth stories and maintained a blog that features shorter stories from Times staffers, live chats, and guest contributions from outside writers. The idea for the Chicago story came from a Seattle-area community group that admired the Logan Square program. Shaw ultimately traveled to Chicago to report on the program, aiming to find what worked well there, what could be improved upon, and whether its model might be applicable to Seattle-area schools. Other Times staffers have traveled around the country and the state, examining universal free preschool in Tulsa, a community college in Walla Walla that’s lowered dropout rates, and numerous programs throughout Seattle and its suburbs. Education Lab launched with funding from the Bill and Melinda Gates Foundation and the Knight Foundation. The initial grants were for one year, but Education Lab’s financing was extended for a second year and its coverage will continue. A couple months after Shaw’s story on the Logan Square Neighborhood Association was published, two of the Chicago nonprofit’s staff members were sitting on stage in a high school auditorium in a Seattle suburb as part of a Times event discussing parental involvement in schools. Immediately after the story was published in December, the Times also held an online chat with staff and volunteers from Chicago and solicited stories from readers about their own involvement in their kids’ schools. The February event was held around dinnertime on a frigid Thursday night — the kind of night where the last thing you want to do is leave the house again after a long day of work or school — but the event drew an audience of 150 people that didn’t look like the Times’ typical readership. The average Seattle Times reader has a household income north of $90,000, and 46 percent have a college degree. But the Times’ event, which was also sponsored by a local education advocacy group called the Road Map Project, was a diverse gathering of mostly middle to low-income advocates and parents, many of whom were immigrants. There were translators available for Spanish and Somali speakers, and the original story on the Chicago program was even translated into Spanish and distributed at the event. (A weekly Spanish newspaper in nearby Yakima owned by the Times’ parent company also ran a condensed and translated version of the story.) Dinner was also served at the event, and childcare was provided, too. “The journalism translated very powerfully into a change discourse — to flip the problem very literally from ‘Low-income immigrant parents are shut out of schools, and it’s always been that way, and we’re ticked off,’ to ‘Okay, here’s how they’ve done it in Chicago. It’s been working for…years. Here’s what we learned, and here’s how we might deploy some of these ideas in Seattle,'” said Keith Hammonds, the Solutions Journalism Network’s chief operating officer. “It was really a cool catalytic conversation going on among a big crowd of community organizers, educators, and parents,” Hammonds continued. “We’re going to talk to other parents…about this meeting and get more of them involved,” said Santiago Armenta, a middle school parent who “spoke little English,” according to a report on the event in the Times. The Times also held another event last May, where it invited five college students to share stories on the theme of “How I got into college.” The event was modeled after public radio’s The Moth; the Times put on a similar second event on Nov. 15 with five new students. More informally, Times education staffers have gone on a listening tour of sorts, holding conversations and meetings with groups from teachers’ unions to grassroots education advocates to discuss Education Lab, solicit story ideas, and understand what various stakeholders want from the Times’ coverage. “They want to hear more about what we do, and they like the opportunity to have input into possible things we can cover and offer feedback on what we’ve done so far,” Shaw said, adding that the Times is planning additional Education Lab events through the end of the year and into 2015. Reader response to Education Lab and the solutions journalism approach has generally been positive, according to a survey of 780 readers the Times commissioned. About half of all respondents said they noticed that Education Lab stories were different than the typical story in the Times. More than half of respondents also said that their perceptions of certain education issues changed due to Education Lab stories, though the responses varied from topic to topic. For example, after that story on how Walla Walla Community College is increasing enrollment and reducing its dropout rate, 78 percent of respondents said they now think there are effective ways to address the problem of students dropping out of community college. Meanwhile, 74 percent said the story changed the way they thought about the topic, and 91 percent of respondents said they appreciated the focus on a solution that seemed to be working. The Education Lab project initially received $450,000 in funding from the Gates Foundation, and a majority of that money was used to hire two new reporters to join the Times’ education beat. The Times also hired a community-engagement editor and assigned an editor and a photographer to the project. The Times and SJN have taken great pains to say that despite the funding from Gates, the coverage on Education Lab is editorially independent. The Gates Foundation has strong opinions about the direction U.S. education should take, including spending more than $200 million to promote Common Core standards across the country. Still, some questioned whether Education Lab’s coverage was being influenced by the foundation. “The underwriting of daily newspaper journalism by Gates, either directly or indirectly, has compromised, perhaps fatally, The Seattle Times’ credibility as a news source,” said one of the Times’ survey respondents. In a Q&A on the Education Lab site and in our conversations, both SJN and the Times stressed their independence. Before the partnership, the Times had been interested in seeking funding from the Gates Foundation — by focusing on the solutions journalism method, the paper felt it could accept the funding while staying away from the foundation’s specific advocacy issues, said David Boardman, the former executive editor of the paper who launched the partnership with SJN. “It was a little tricky for us as a newspaper for Seattle because the Gates Foundation is such a major institution in Seattle and we covered them aggressively and because they’re perceived as having a particular perspective on a lot of education policy issues,” said Boardman, now the dean of Temple’s School of Media and Communication in Philadelphia. The in-depth partnership with the Times was a first for SJN, which had only been around for six months before it began its work in Seattle. After the partnership began last October, SJN was more heavily involved in the journalistic aspects of Education Lab. Initially, SJN ran a general workshop with about 60 or so Times staffers to introduce them to the solutions journalism method. It then did more specific training with the education beat reporters who would be directly involved with Education Lab. As reporters began to write stories for Education Lab last fall, SJN brought in education journalist Peg Tyre to work with the them. For the first six months or so, she would call the Times reporters and editors every few weeks to help them develop reporting strategies and narrative arcs for stories in the series as they developed. But as the Times staffers have become more comfortable with the solutions journalism method, SJN has taken a more hands-off approach when it comes to advising the actual journalistic output. Instead, SJN has focused on community engagement, measuring the impact of Education Lab, and educating other journalists (especially education reporters) in the solutions journalism method. Events are a key part of the Education Lab mission to facilitate a discussion in the community around education issues, but that commitment extend beyond events, SJN’s Hammonds said. “It’s creating that channel — it’s creating pipelines for sources, but also for participants, people who can join as guest writers on the blog or participants in larger public events with an eye toward expanding the public discourse,” he said. And to measure how the public discourse is being expanded, SJN plans to continue to survey community organizations and players in the education sphere in the coming months to gauge their reaction to Education Lab and how it can continue to be improved. SJN also is considering forms of content and semantic analysis as well. SJN is looking to take the lessons from Education Lab to other metro newspapers. Education Lab staffers have helped produce videos, audio recordings, annotated stories, and more that will be part of an online toolkit other journalists can use to learn the solutions method. SJN also plans to hold an event next September that’ll bring together 25 education journalists from around the United States to help them develop solutions journalism strategies and to learn from the Times’ experience. Moving forward, however, SJN doesn’t anticipate that it’ll be involved in a project as extensively as in Education Lab. Instead, it’ll focus on a handful of intensive yearlong partnerships to create big one-off stories or series. The network is now in discussions with another newspaper about a project around education and a series on violence protection is also in the works for next year, Hammonds said. 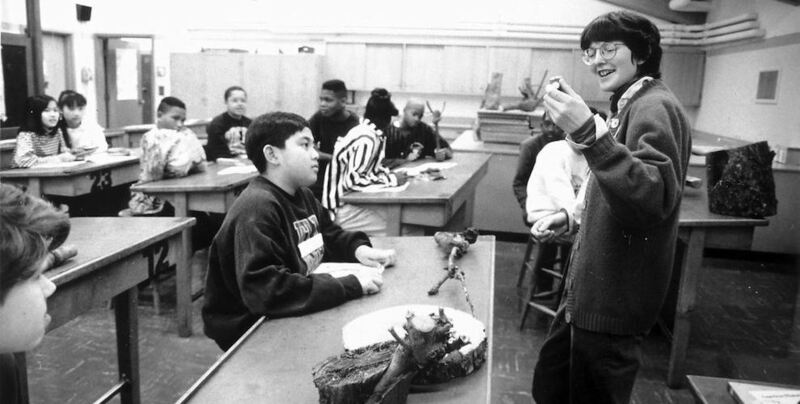 Photo of a 1990s-era Seattle classroom from the Seattle Municipal Archives used under a Creative Commons license. POSTED Nov. 18, 2014, 11:25 a.m.
Lichterman, Joseph. "Solutions in Seattle: A partnership has helped The Seattle Times rethink its education coverage." Nieman Journalism Lab. Nieman Foundation for Journalism at Harvard, 18 Nov. 2014. Web. 18 Apr. 2019. Lichterman, Joseph. "Solutions in Seattle: A partnership has helped The Seattle Times rethink its education coverage." Nieman Journalism Lab. Last modified November 18, 2014. Accessed April 18, 2019. https://www.niemanlab.org/2014/11/solutions-in-seattle-a-partnership-has-helped-the-seattle-times-rethink-its-education-coverage/.